This is a detailed product review for a supplement called Healthy Brain All Day Focus which is manufactured by Applied Nutrition. The manufacturer states that this product has a triple effect, as it can help improve short term and long term memory as well as boost energy levels throughout the day. This dietary supplement enhances focus and concentration and it improves the ability to retain information while promoting the production of antioxidants. Reading this review will focus on important details about this product, such as dosage and ingredients. This remedy has a quite a few active ingredients, such as Vitamin D 3, Vitamin B12, Brain boosting botanical blend and Neuro Nutrient Blend. Apart from these active ingredients, the supplement also contains Tricalcium phosphate, microcrystalline cellulose, calcium carbonate, stearic acid, croscarmellose sodium, gum Arabic, silicon dioxide, magnesium stearate, sodium carboxymethylcellulose, dextrose, soy lecithin, sodium citrate and dextrin. The optimal dosage for adults is two tablets per day. For best results the label recommends customers to take one tablet in the morning and the other one in the afternoon. Under no circumstances should this two tablets per day dosage be exceeded. This remedy is to be taken by adults only. Children under the age of 18, as well as pregnant or nursing women should not take this supplement. Moreover, people who take other prescription drugs should also avoid this supplement. One bottle of Healthy Brain All Day Focus is $19.99. A container has 50 tablets, just enough for 25 days. The bad news is that the manufacturer has no additional discounts and not even package deals or available monthly subscriptions. Regardless, the supplement still remains fairly affordable. Additionally, we were not able to find out anything about shipping fees, so the $19.99 may not be the final price. The worst thing about this product is the lack not of a strong guarantee, but of a guarantee at all. The manufacturer fails to deliver any information regarding refunds or return policies. In case customers decide that this supplement is not working for them, they actually have nothing to do except maybe to throw the tablets away. Another negative aspect of this remedy is the lack of customer reviews. 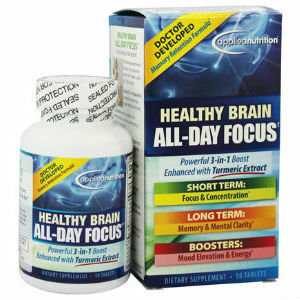 All in all, Healthy Brain All Day Focus is a very affordable product. It has a combination of ingredients that have been proven effective in treating memory and focus problems. In spite of these positive aspects, the supplement also has some shortcomings. First of all, the fact that it contains soy may be a problem for customers with dietary restrictions. Second of all, the missing customer reviews and guarantee are raising serious questions as far as the effectiveness of the product goes. Henry Costa	reviewed Applied Nutrition Healthy Brain All Day Focus	on November 15th	 and gave it a rating of 2.5.